This American Robin is feeding on the fleshy cones of Red-berry Juniper, Juniperrus coahuilensis, in the foothills of Four Peaks, Maricopa Co., Arizona. Nov. 2009. 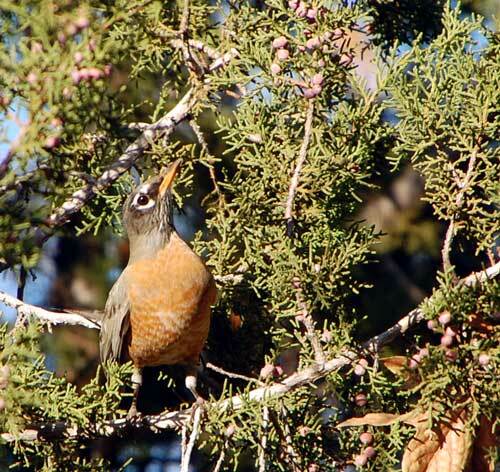 At elevations above 1200 m in Arizona's sycamore woodlands the American Robin is a fairly common denison year round. In winter these populations swell as birds move south and down slope from higher elevations in search of food, primarily fruit such as hackberries and juniper berries. In summer robins nest in trees and forage for insects and earthworms especially in open grassy areas. Distinguishing Characteristics: Chest and belly rufous-orange, wings and back dark brown-black, throat and lower belly white. There is a broken, white ring around each eye. Beaks are sturdy and straight. Occasionally during the winter months the similar Rufous Backed Robin appears, having descended from higher peaks south in Mexico. As the name implies it is distinguished by a patch of rufous orange on the back.